October 5, 2012 - Northrop Grumman, the Defense Advanced Research Projects Agency (DARPA) and NASA Dryden Flight Research Center have successfully completed a series of flight demonstrations, moving DARPA's Autonomous High-Altitude Refueling (AHR) program closer to demonstrating the first autonomous aerial refueling between two unmanned, high-altitude aircraft. The lead receiver aircraft extended and retracted its aerial refueling hose several times, completing all planned tests to validate the associated program hardware and software. The trail tanker aircraft successfully demonstrated precision control in formation with manual and automated "breakaway" maneuvers, important safety features and criteria of the test program. 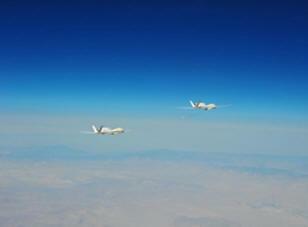 Two Global Hawk unmanned aircraft successfully flew for the first time in close formation as close as 30 feet. During the close-formation flight, the aircraft rendezvoused and flew for more than 2.5 hours under autonomous formation control, with the majority of the time within 100 ft (or one wingspan) of each other. "The technical developments that enabled these two high-altitude, long-endurance unmanned Global Hawks in close formation is an outstanding accomplishment for the AHR program," said Fred Ricker, vice president and deputy general manager for Northrop Grumman Aerospace Systems' Advanced Programs & Technology. "Coupled with the advanced design and technical implementation of aerial refueling systems on board both aircraft, the demonstration has truly brought a concept to life, which has the potential to change the operations for unmanned aircraft utility and enable mission flexibility never before realized." Northrop Grumman and NASA Dryden Flight Research Center conducted several demonstration flights in the buildup to the close formation flight, which included tanker and receiver first flights and a distant formation flight. The Northrop Grumman-NASA-DARPA team worked closely to ensure that all safety precautions and measures were taken when preparing for and conducting all of the ground and flight demonstrations. Preparation included a calculated approach to ground and flight tests, which included extensive analysis, simulations, laboratory and ground tests as well as multiple safety review boards. The $33 million DARPA AHR program aims to demonstrate autonomous fuel transfer between two Global Hawks, enabling flights of up to one week endurance. AHR is a follow-on to a 2006 DARPA Autonomous Aerial Refueling Demonstration (AARD), a joint effort with NASA Dryden that used an F/A-18 Hornet as a surrogate unmanned aircraft to autonomously refuel via a probe and drogue from a 707 tanker. As part of the U.S. Navy's Unmanned Combat Air System Carrier Demonstration program, Northrop Grumman is also developing AAR technology to help extend the operating range and flight duration of future carrier-based unmanned systems. The company plans to conduct AAR demonstrations in 2014 using the Navy's X-47B unmanned demonstrator aircraft.